Today we face dragons. Some were here when we arrived, others we ourselves unleashed, inattentively, perhaps even mindfully. But they are here, growing in strength, in spread, in number. Tomorrow, we must rely on our children to protect us. For that, they must understand the world, its countless patterns and fractal details, and be able to focus on the key elements of a given puzzle, yet grasp how it fits in the larger whole. Geography is the study of the world and all that is in it, or was, or could be, at infinitely varied scale. These infinite details link together to make patterns in interlocking systems. If we can tease out the patterns – assemble the vast galaxies of data and classify, symbolize, query, analyze, and model – we can find the keys that help us answer questions, solve problems, design solutions. Geographic information system (GIS) technology allows us to find, generate, integrate, analyze, manage, and display data, illuminating the patterns and relationships large and small. The tools come in all sizes, shapes, and powers. As children explore and analyze their world, they build the capacity and disposition to see patterns, integrate information, discover relationships, make decisions, solve problems. Like a fire, it grows, slowly at first, needing consumable tinder before sticks, logs, and trunks. But kids devour content like web-based maps, use the tools to leap from the near and familiar to farther afield, bringing along their skills and knowledge, testing those against new situations. They poke into interesting worlds, find crevices, explore ideas, inhale new details. Restlessly, they seek the next challenge, take the larger step, find the next hill to climb and peer over, discovering new concepts and perspectives with which to build capacity. Around the world, GIS is used in countless jobs, in hundreds of careers, because people need to solve problems and have to understand the nature of things to do that. Esri makes GIS software, and every year we have a conference at which people from around the world meet to celebrate their victories and learn from each other how to do a little more. This year, 14,000 practitioners assembled, including over 800 educators. The International Conference grows every year, and the Education Conference this year grew like wildfire. People are finding hope in problem-based learning, in helping youth from elementary school to graduate school think critically, work collaboratively, dig for answers, extract patterns, and see how to make a difference in their lives, their community, and the planet. They build background in tackling unfamiliar problems, bulking up in STEM fields and social studies content, in communication skills, opening doors to more and more future jobs as they grow. We will never run out of problems. But, through the power of maps – our common language – we can explore, analyze, and understand our world, and diminish those dragons around us. I love maps and have just finished mapping the journey of the pilgrims to Canterbury. So much information that I did not know. As a school teacher armed with only a set of pull down maps and Oregon trail the kids and I learned to research the trails and culture of the west. As an adult I have married an Englishman and have been traveling the castles of Europe, learning the maps of the battles and it was fascinating to see that the knowledge of the maps gave power to the Farnese family ( popes and all in the family) There is a room in the palace near Rome of the maps of the day, I tried to photograph it but I am not Ford Cochran… this knowledge helped to make people rich. It was not always in the books. 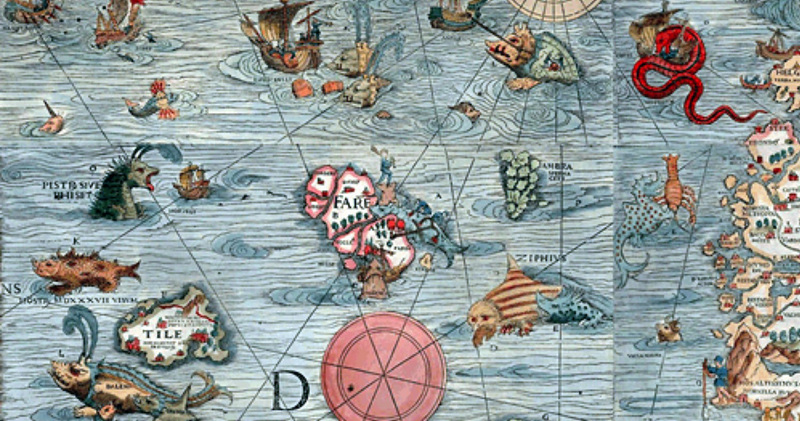 We who love maps debate about whether Prince Henry the Navigator had Chinese maps. Thomas Jefferson surely visited here and created , some of his ideas for his home, Monticello here. Dragons are the lore of the east and the west. Dragons in England are of history. Children I taught used to create castles, but I fear our imaginations did not meet with the money, knowledge and resources available to the very privileged thought we did have the knowledge of David McCaulay, ( Castle and Cathedral) we had not the inside view of the culture of castles. Even a movie is bereft of the intricacies of the various castles I have been privileged to roam, some with moats, some with black swans and huge gardens, some with a resident gardener who was responsible for some of the foods eaten at the castle. Dragons, East and West are very different. I was told while studying in China that the dragons lost toes traveling to the East. I prize as one of my trophies of travel a wonderful dragon that I brought back from China. I know that there was Saint George and the dragon of England seem to be elusive except in the photos one takes at the castle like the one I visited yesterday. Leeds Castle.. full of books and art and maps… who knew that Lord Culpeper and Lord Fairfax came from this area. I taught 4th Grade History for years.. who knew? the Castle is directly connected historically by sundials that give the time in each place to the other. The timeline of the castle is available on the Internet .. but I never saw the dragon.. just the maps.